On the occasion of the company’s 70th anniversary, LG presented a large-scale light installation at the Milan Design Week 2017. The installation was developed in collaboration with Japanese designer Tokujin Yoshioka. 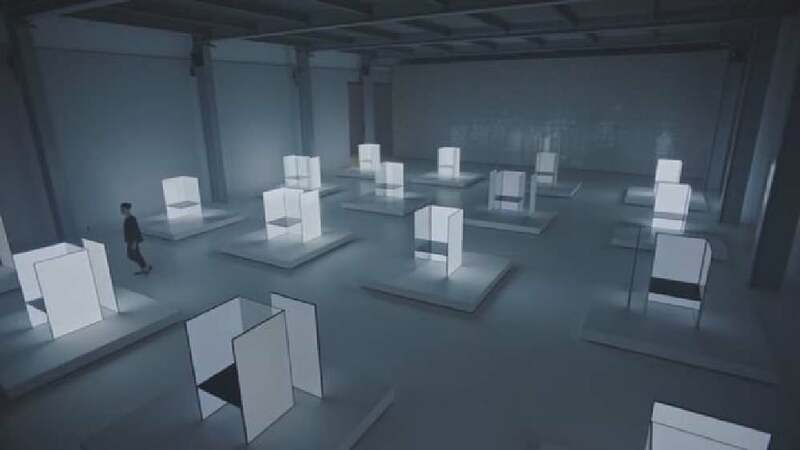 Under the title “Tokujin Yoshioka x LG – S.F_Senses of the Future”, the work aimed at illustrating the relationship between man and nature, as well as expressing LG’s design philosophy that innovative technology must be oriented towards human experience. The result was an exhibition separated into two parts with an installation consisting of different light elements made from ultra-thin LG OLED products. “S.F Chairs” showcases 17 dynamically illuminated OLED chairs that interpret this rather generic yet iconic piece of furniture by projecting it into the future. “Wall of the Sun”, on the other hand, is a 16 metres wide and five metres high surface featuring almost 30,000 individual pulsating OLED modules. It simulates sunlight by exuding appealing warmth to visualise how human-oriented lighting could be envisioned in the future. This exhibition, instead of presenting concrete products, uses OLED technology in a highly poetic approach for creating an abstract room installation, which, with its pulsating lights and colour plays, has a strong emotional effect and leaves a deep impression on visitors. This makes the strengths of the technology impressively come to the fore in a minimalist yet imaginative environment. Overall, the entire installation is perfectly staged and executed. LG Electronics Inc., LG Display Co., Ltd., LG Hausys Ltd.